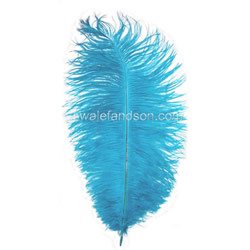 Minimum order quantity for Drab Feathers is 1/2 lb per color. Ostrich Drab Feathers are typically much smaller than Wing Plumes. They may look similar but drabs are actually much different. The fibers are shorter and thinner and so are the quills. 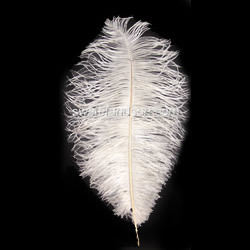 The tips of Drab Ostrich Feathers below 17" usually don't droop the way a Wing Plume's does. Ostrich Feather Drabs sized 17" and above usually have droopy tips and are very commonly used for tower vase centerpieces. In the longer sized Drabs the fibers grow proportionately longer and have a similar effect to Wing Plumes when used in a tower vase setting. Ostrich Drab feathers are available from 9 " all the way up to 22" and with the exception of steaming, are graded as #1 Quality. Note: not all colors are available at all times.